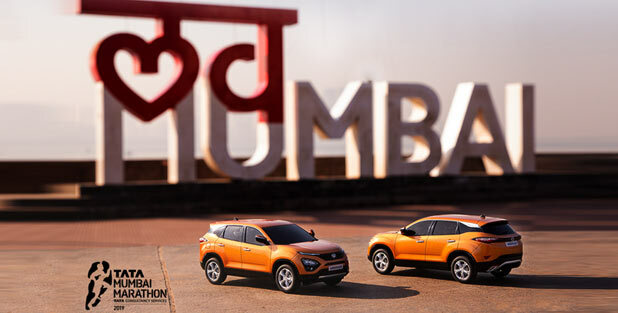 Tata Harrier – the official lead car of the Tata Mumbai Marathon 2019, today started the Tata Mumbai Marathon Trophy Tour 2019, ahead of this year’s edition of the iconic race. The much anticipated Harrier is proudly ferrying the winner’s trophy across the city of Mumbai projecting its superlative Impact 2.0 design language and its muscular build, based on the legendary D8 architecture of Land Rover. Culminating on 18th January, this tour is also the public debut of this much awaited SUV on the streets of Mumbai. The tour is scheduled from the 14th- 18th January and will cover the leading corporates of Mumbai, visiting the campuses of TCS, BNP Paribas, Tata AIG amongst others who have the maximum registrations for the 2019 edition of this prestigious race. Enthusiastic runners in these companies will get a chance to see the trophy up close and also witness the Harrier in the full flesh. Additionally, customers will also get an opportunity to book the Harrier at these events and get their hands on the limited edition Collectors item- a scale model of the Harrier, which will be handed over to them at the time of the vehicle delivery. According to Mr. Vivek Srivatsa, Head- Marketing, Passenger Vehicles, Tata Motors – "We are pleased to associate with the Tata Mumbai Marathon again. We have enjoyed a fruitful partnership with the event, which only continues to grow stronger. We have been buoyed by the response received during last year’s edition. This year, we are back with yet another winner on our hands- our much awaited vehicle and the new benchmark of SUVs, the Tata Harrier. The Harrier will be the lead car in the race this year. We are delighted to give a preview of the Harrier and the trophy to the fans in Mumbai." According to Mr. Vivek Singh, JT. MD Procam International – "We are very pleased to have the Tata Harrier make its foremost public appearance at the front of Tata Mumbai Marathon and what’s even more exciting is that our lead vehicle will showcase the glory of the Mumbai Marathon trophy. The trophy was specially crafted by acclaimed artist Paresh Maity, encapsulating the energy of the run and the 7 islands of Mumbai. The human figure exuding confidence is not just the Marathon runner but the everyday Mumbaikar, whose journey takes him across the seven islands of the city. Standing on seven pillars also symbolises the human emotions that a runner overcomes to finish his run." Offering exemplary driving dynamics, this 5-seater monocoque SUV has been extensively tested for a cumulative distance of 2.2 million kms, showcasing its mettle to wade through the toughest of terrains. Powered by the cutting-edge 2.0L KRYOTEC diesel engine, the vehicle delivers exceptionally refined drivability and performance. Harrier will be the first product to sport the Impact 2.0 Design language from Tata Motors and will offer extraordinary exteriors, intelligently designed luxurious interiors, future ready connectivity and infotainment.